Perfect for making decorations, cards and pictures and hold well once the glue has dried. A traditional and engaging tool that has been exciting small children for years, our Glitter Glue Pens 10pk Assorted promises to delight. 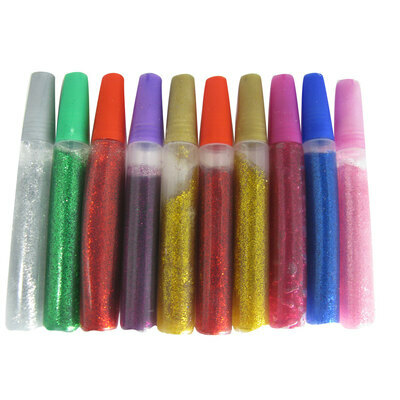 Mixing loose glitter and fluid glue, each of these individual glue tubes features it's own screw down lid and vibrant iridescent or glitter colour. Simply squeeze the tube to release a line of glitter glue - reducing the level of mess and the number of products needed on your crafting table at any given time. The sizeable pack is presented in it's own sturdy box which is ideal for both transportation and storage. We have a wide range of glitter products to choose from here at Gompels from our Assorted Loose options through to Assorted Glitter Paper A4 and our Glitter Stars Multi Colours Shaker.